Whether you’re looking for fresh date-night ideas or something new to occupy the homebody days of winter, Buffalo serves up a plethora of opportunities to exercise your creativity in tactile mediums. Local craftspeople are eager to impart their wisdom through workshops that not only produce a take-home product you’ll actually want, but also develop the skills you’ll need to keep on crafting long after class lets out. There’s an option for anyone, no prior experience—or artistic ability—required. Here’s a collection by the material you work with (and the level of commitment you can handle). 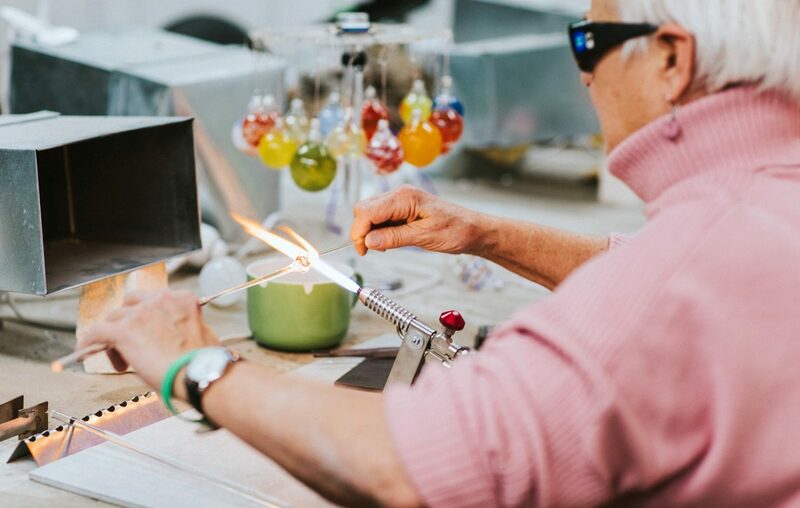 You can also head over to the Foundry for Beginner Glass Blowing sessions ($55) with Jason Dederich of Buffalo Glass Company. He’ll teach you how to turn the pipe like a pro while you blow your own ornament. Want more? Sign up for private classes with Vicki at her studio to delve deeper into the craft. By hand, by machine or both, learn the techniques that interest you most by choosing a class based on the methods it utilizes. Not sure what you’ll like? Then opt for a class based on the final product you want. Want more? The Foundry also offers monthly Woodshop Safety courses ($35) that qualify you for supervised use of their shop going forward, so you can create anything you want on your own schedule. But you won’t leave empty handed: You’ll create a cheese board while learning all the major tools in the process. For a modern twist, handcraft your own metal shadowbox shelf at The Foundry ($50), which will have you cutting on a chop saw, welding and finishing with a grinder. Want more? Just like with wood, the Foundry hosts monthly Metalshop Safety courses ($35) that unlock access to their metalshop during supervised hours. Or if you’re comfortable making a slightly bigger commitment, go for one of their Beginner Pottery six-week courses (around $210), which gives you time to explore its possibilities. They also offer advanced courses: Good to know for down the road. Calligraphy, papermaking, screen printing, book binding and even Japanese woodblocking—if it touches paper in some capacity, WNY Book Arts Center likely has a workshop to master it. Not sure what a technique is? Head over to their site to find helpful descriptions and introductory videos so you know what you’re getting into. Want more? Once you’ve completed the workshop, WNY Book Arts members can take advantage of their Open Studio hours, hosted twice a month on Saturdays.